At the outset, I convey my best wishes to you. 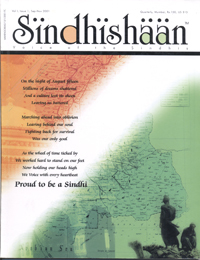 I have received the copy of “Sindhishaan – The voice of Sindhis”, with great pleasure. The publication has a very impressive get up and equally interesting contents. Such a publication was very much required. Sindhishaan will give the Sindhi community an opportunity to express their feelings and aspiration. My Heartiest congratulations and best wishes for the success. I take this opportunity to send you a profile of Priyadarshani Academy along with other books and literature for your reference.